All Blair wanted was to fit in and find a place where her dark past wouldn’t keep following her and haunting her. After many moves Blair and her parents end up in the small farm town of Shady Oaks Kentucky. Having always moved around from one big city to the next, a small farm town with country side and horses was the last thing Blair expected to find and fall in love with. Here in Shady Oaks, Blair finds real friends and starts to imagine she could have a real life there. Than someone from her past shows up, and everything crumbles. Would she be able to stand her ground and overcome her past here with the new friends she has, or will they turn on her like everyone else has in the past? Being a teenager is hard these days, the world is hung up on social media presence, how many followers do you have, is your life documented one image after another for all the world to see? No matter how much we may try to delay this, it happens, our children are exposed to the world online and it has permeated even into their education system. Parents can no longer protect their kids from the world online. The increase of social media has made bully’s even more prevalent, no longer is it teasing on the playground, the bullies follow their victims’ home and even when they move to their new homes. Michelle Areaux does an amazing job at showing how this can impact their lives. Written for this age group, they can relate to the characters, the school groups, the feeling of being the new kid. The story is relatable. It is not so far-fetched, even with Blair’s secret, to believe this could be any kid in the school with them. The feelings are real, and the personalities are believable. Hunter is very endearing, and you want to love him from the start, same with Grace. I was drawn to all the characters, I felt like I could have been Blair, or Grace at different points in my life. Now I relate to her parents as I navigate the world of mental illness, bullying, cyber-bullying, and all the other stress that kids these days face with my own children. They thought moving all the time was what was best for Blair, they wanted to do the right thing for her, to make her life easier. It is what all parents want, to give their kids a better life. Moving to Shady Oaks was the best thing they could do for Blair and their love and frustration at helping her find her normal is easy for parents to relate to as well. 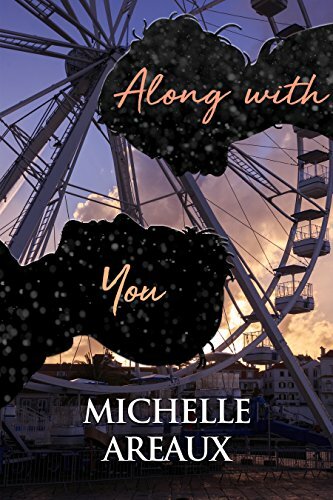 Along with You by Michelle Areaux is a young adult novel that is filled with topics we should all be talking to our teens about. This would make a great book club or family reading novel to share with young teens that are facing a world filled with technology and social media. It covers topics of bullying, cyber bullying, and the fact that once things are online they never really go away.